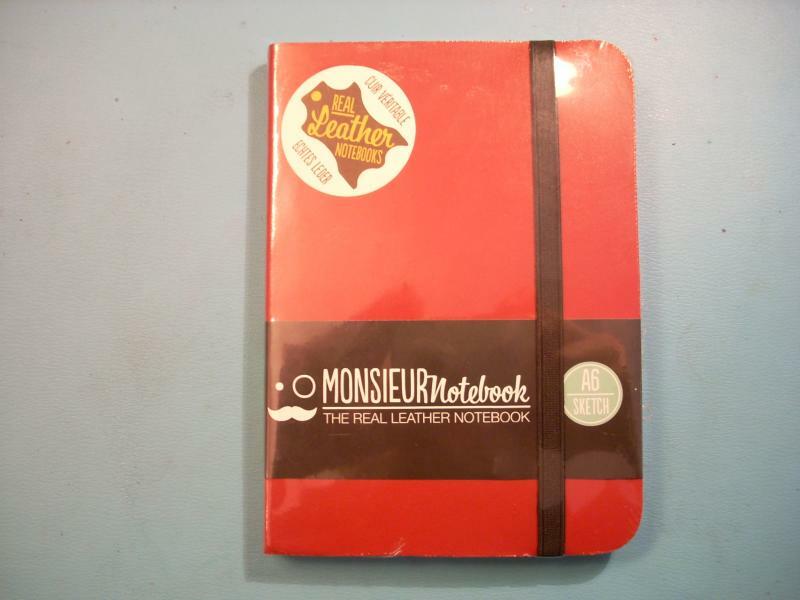 What's Up With The Monsieur Notebook? Good looking notebook, bought the sketch book since I like unlined paper. 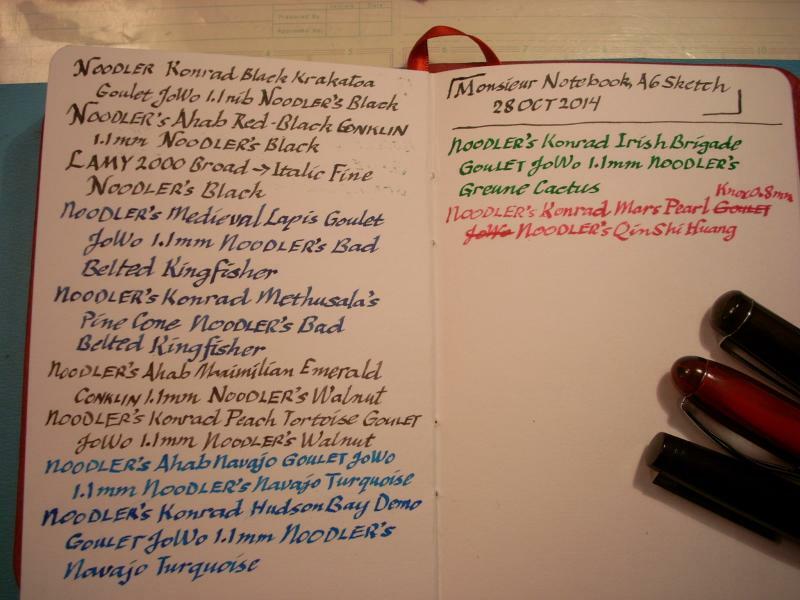 Tried my favorite Noodler inks and got good results. Noted that previous reviews compared Monsieur to Rhodia and (gasp) Moleskin. 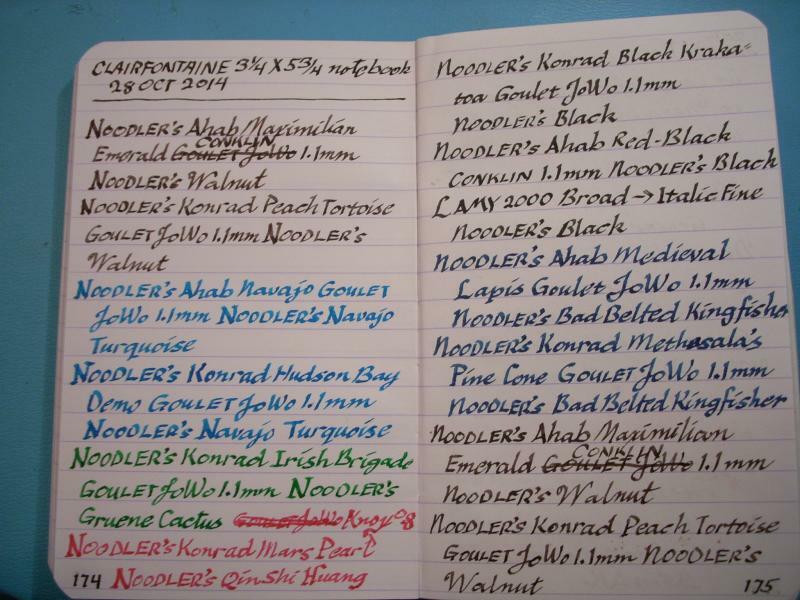 So used the same pens and inks in a Moleskin and a Clairefontaine (no Rhodia in hand), got comparable results. See next post for pictures of the comparison notebooks. What do you think? Comparable? Or not? Hey. 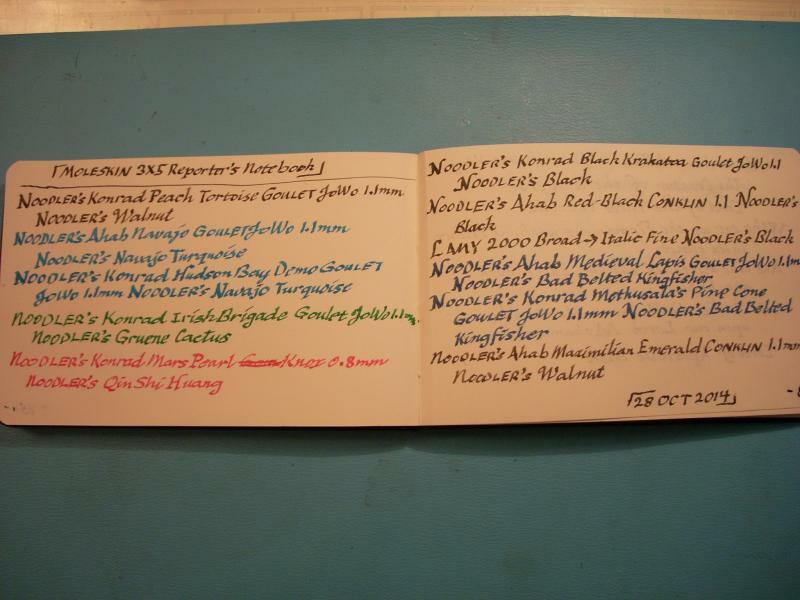 I am wondering if you can give any further impressions of this notebook now. In previous reviews that I have read around the internet issues like really stiff binding (causing the pages to be cut by the binding, and come away from the spine. I can kinda see this happening in your notebook already), the book not fully closing but also not staying open on it's own, poor quality control overall (with issues with the paper having marks, some being watermarked, uneven and messy gluing) seem to plague this book. I am wondering if they are getting better, or if these issues still exist. As for the paper quality, based on your pictures, I have to say it looks to be the worst of the 3 you have compared.The Moleskine has slight show through in some areas, and a little bleed through down the bottom of one page (although it is fairly minimal), and the Clairfontaine, as expected, looks perfect. The Monsieur notebook however is showing a fair amount of show-through and bleed-through. I think I can also see some marks in the paper, but that could just be noise in the picture. Currently collection:Lamy Safari's x5, Lamy Al Star's x3, Lamy Studio's x2, A Lamy 2000, Kaweco Sports/AL Sports x7, Noodlers pens (Konrad and Ahab) x10, Noodlers Konrad Ebonite x2, Hero 616 x10, Reform 1745 x10, Sailor 1911m x2, Sailor 1911 Realo x3, Sailor Pro Gear Realo x2, Sailor Pro Gear Imperial Black, Sailor 1911 Sterling Silver, Visconti Opera Club Cherry Juice (M Dreamtouch Nib), Visconti Opera Elements x3 (Amber and Black with M Dreamtouch Nib, Blue with M Gold Nib), Visconti Homo Sapiens Steel Age Maxi, Visconti Homo Sapiens Bronze Age, Montblanc 146 Le Grande... Plus I am sure I have forgotten some. Hello - Tom from Monsieur Notebook. It's good to see that people are interested in our products! Unfortunately we have had a few complaints regarding binding in the past - most of these came from the same batch of Tan Fountain books, and from around the same period. It is inexcusable - the books should not have made it through quality control. However, we've manufactured 1000s upon 1000s of notebooks, so these are very isolated instances. Our quality control is very tight. If there are any more books from this batch still in circulation, or indeed if a customer finds any other fault, we replace the product free of charge immediately. Regarding the paper, the notebook you reviewed here is a Sketchbook. This is made with 140gsm Cartridge paper, and is designed for charcoals, chalks and pencils. Cartridge paper is essentially blotting paper - and not recommended for Fountain Pens. Our 90gsm Ivory paper, or our 100gsm White Foutain paper, is much better suited. Please visit us at www.monsieurnotebook.com if you have any further questions! Wow! You answer four month later. I sould still have hopes I will get an answer to the question I posed in your web page. My experience with the 100gsm paper was horrible. I purchased the notebook at amazon and returned it after trying a few pages. The behaviour was erratic. Some part of the page was more or less ok but others showed severe feathering. They are available down under from notemaker.com.au but talk about being made in India. Might be a different product. My limited expereince (one notebook) was that the paper was terrible for FP use. Maybe that has changed now. Southworth 100% Cotton Resume Paper, Is This Good For Fountain Pens?